Sugar is an ingredient we all know that we should be eating sparingly — too much sugar is never good for you. But there are actually two very different types of “sugar”: naturally occurring sugars and added sugar. So what’s the difference between the two? And is one healthier for you than the other? Added sugar includes any sugars or sweeteners that are added to foods during processing or preparation (such as putting sugar in your coffee, or eating flavored yogurt, or eating sugary cereal). You’ll see them on the ingredients list as: brown sugar, pure cane sugar, turbinado sugar, coconut sugar, raw sugar, molasses, maple syrup, honey, corn syrup, brown rice syrup, agave, evaporated cane juice, and high fructose corn syrup – to name a few. When it comes to added sugars, are some healthier than others? Like is honey healthier than regular sugar? NO. It’s not! No type of sugar is really, truly “healthier” than regular table sugar. While sweeteners like honey, coconut sugar, maple syrup, and molasses are less processed than the other sugars on this list and their raw/organic forms do have additional health benefits, in your body they act just like white granulated sugar would in terms of raising your blood sugar. For added sugars, sugar = sugar = sugar. No type is healthy and every type should be eaten very sparingly. Naturally occurring sugars, on the other hand, are sugars that are part of a whole food: like the lactose in milk, or the fructose in fruit. The kind of sugar that you want to limit in your diet are the added sugars — since these sugars provide unnecessary calories and no helpful nutrients. Natural sugars act differently in the body thanks to the protein, fiber, and water content accompanying them in a whole food, and are lower on the glycemic index than added sugars (which basically means that your body doesn’t absorb the sugar as fast, and your blood sugar doesn’t “spike” and then “crash” as a result). And therefore, natural sugars are better for you than added sugars: e.g. it’s much healthier to eat 1 cup of plain unsweetened yogurt vs. 1 chocolate bar. Unless you’re a diabetic, you don’t need to worry too much about naturally occurring sugar in whole foods like fruit and plain dairy (yogurt, cheese, milk). While these naturally occurring sugars aren’t bad for you, with any food, you should still monitor portion size. So even though the protein in dairy, and the fiber + water in fruit helps your body to absorb the sugar slowly and steadily, going overboard and eating 10 fruits a day would be too much natural sugar in your diet. 2-3 servings of fruit per day is a good amount for most healthy adults; and for dairy, as long as you’re choosing plain, unsweetened dairy like regular milk, plain yogurt, cheese, etc. the lactose (natural sugar in dairy) is not bad for you. I generally don’t “limit” my intake of natural sugars – I’ll choose fruit for dessert or a snack and get my 2-3 servings a day that way. Note: For added sugars, nutrition experts recommend limiting added sugar to 6 teaspoons per day for women (24g) and 9 teaspoons per day for men (36g). 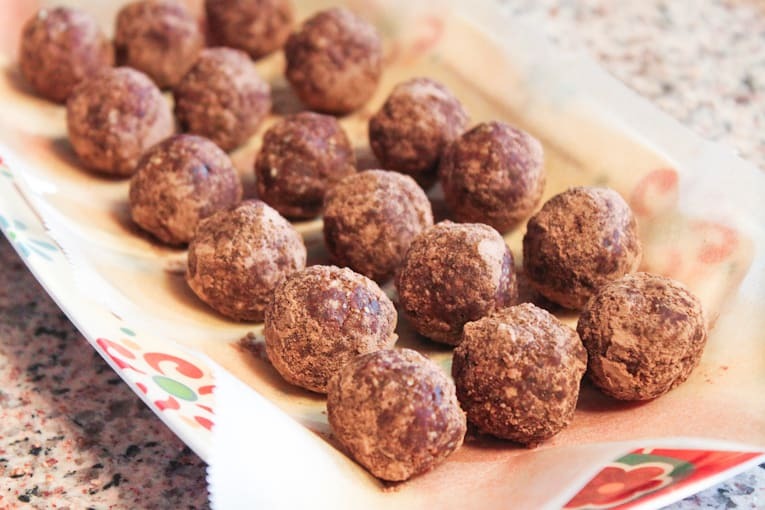 Cocoa Oat Truffles: Little bites of chocolatey heaven, with only 4-6g of sugar and less than 60 calories per truffle! 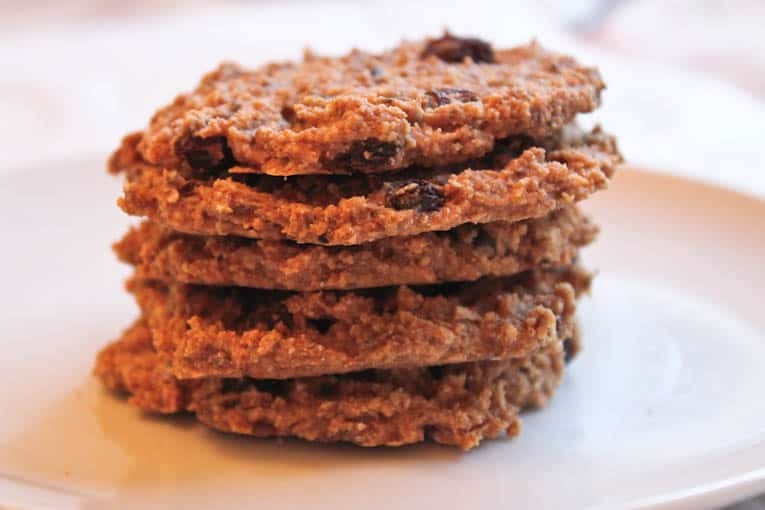 Oatmeal Raisin Cookies: Only 64 calories and 4.4g of sugar in these delicious, chewy, guilt-free cookies! 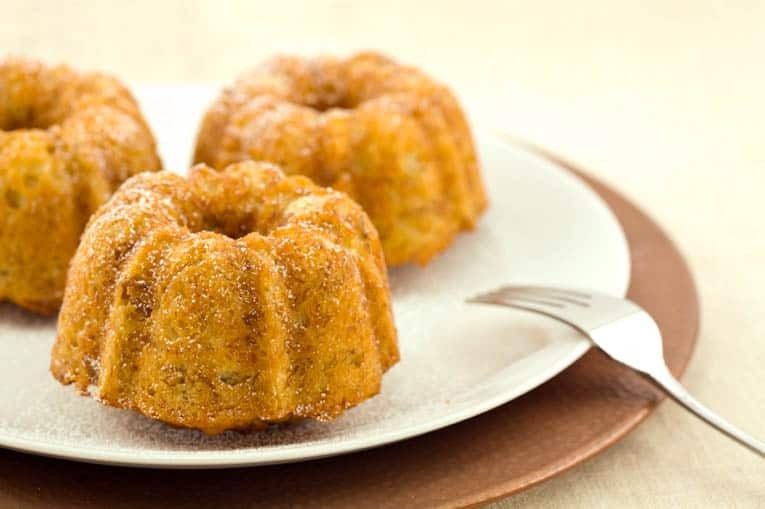 Mini Banana Bundt Cakes (a recipe I created for Women’s Health Magazine): sweetened with pureed raisins instead of sugar! Is organic sugar okay if your doing low-no sugar foods? Hi Tela! 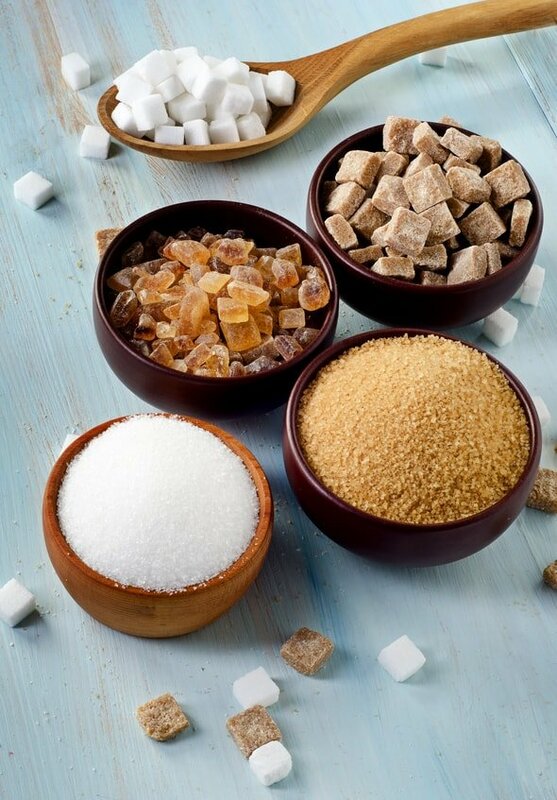 Organic sugar still counts as regular sugar – so you still want to stick to the guideline of no more than 6 tsp added sugar per day (whether it’s organic or not doesn’t matter). Hope that helps! Hi Cortney! If your child doesn’t have any sort of lactose/dairy intolerance, then I actually don’t recommend giving toddlers plant based milk for that exact reason – usually those plant based alternatives have added sugar, and the pea protein doesn’t outweigh the added sugar. Organic Whole Milk has healthy fats and only naturally occurring sugar from lactose – which is much more preferable! I only recommend the pea protein milk for toddlers who have major lactose/dairy allergies because it’s the next best alternative that has protein and isn’t just empty calories (soy milk is the only other option, but I don’t like giving toddlers too much soy). Hope that helps, let me know if you have any other questions! Hi – thanks for getting back to me. I think a potential problem is that when you look at a label and or buy something out it is sometimes how to discern whether whole fruits or juice was used. Is there a way to tell that from the label? Thanks for helping me understand this better. Hi! Ah yes – so if you’re buying something pre-made you have to read the ingredients list really carefully. If it says “juice” anywhere on the ingredients list, then don’t buy it. A healthy, pre-made smoothie that doesn’t have added sugars would only have whole fruits and veggies listed, along with some sort of water (e.g. filtered water) or unsweetened milk (e.g. unsweetened almond, coconut, or soy milk) — e.g. “apples, blueberries, spinach, kale, unsweetened almond milk” – and that’s it! If it says “apple juice” or the word “juice” anywhere on the ingredients list, I’d avoid it. Hope that helps! Thanks for the informative post. I question that came up for me when I was reading it was “what about smoothies”? not the type one would typically find out which do sometimes have added sweeteners but the ones that are more whole food based. Does the process of making a smoothie change the whole in such a way that the sugar wouldn’t be processed as a natural sugar normally would? I’m thinking of the added protein, increase in water or breakdown of fiber during the creation. I’m not sure if I’m making my question clear …..
Hi Jacquie! No problem at all! Good question about smoothies. So if you are making a smoothie from literally just whole fruits, vegetables and some sort of unsweetened milk or water, the natural sugars in the fruits act the same as they would in your body as if you had just eaten the fruit whole. So like drinking a smoothie made with apples, blueberries, spinach and unsweetened almond milk would be the same as if you ate apples, blueberries and spinach whole. The problem with smoothies is only when they are sweetened with sugar/honey/frozen yogurt/flavored yogurt/flavored milks/etc. Juices on the other hand, are problematic because all of the fiber and protein from the whole fruit is strained out and all you’re left with is the sugar. In juices, even homemade no-sugar-added juices, the natural sugars from the fruits are not paired with fiber, water, etc. so they act more like added sugar in your body. I hope that helps clear things up! Let me know if you have any other questions! I have diverticulitis so the seeds in oatmeal cookies is something I have to stay away. What can I use instead? Hi Elly! Do you mean the chia seeds that are part of the batter in the oatmeal cookie recipe? Can you eat them if they are ground? Or do you have to stay away from all chia seeds even if they are ground into a flour? If you are ok with eating them ground, then I would just grind them up into a flour and use them. If you have to stay away from them altogether, you can make these cookies without the chia seeds and they should turn out just fine 🙂 Hope that helps! Let me know if you have any other questions! Hi ! Landed up on your blog searching about added sugar and its effects. Nice Blog and indeed good recipes. Cant help but follow your blog. Keep posting ! Thanks Aditya! So glad you found this post helpful! Hello, I’m not sure if you can help me with this or not but let’s see. I’m confused with things that are organic. For instance, I love jelly so I found this organic jelly but it has 8 grams of sugar. My question is, if it’s organic does that mean the 8 grams of sugar that’s in the jelly natural sugar or is it added sugar? Hi Johnathan! This is a great question! Just because a food product is organic, that has nothing to do with whether the sugar in the product is added or natural sugar. Natural sugar only includes sugar that is part of a whole food: like the lactose in milk, or the fructose in fruit. The organic jelly that you found likely has sugar added to it (e.g. sugar or some form of sugar is listed on the ingredients list). You’ll see it on the ingredients list as: fruit juice, brown sugar, pure cane sugar, turbinado sugar, raw sugar, molasses, maple syrup, honey, corn syrup, brown rice syrup, agave, evaporated cane juice, and high fructose corn syrup – to name a few. The only way any jam or jelly won’t include added sugar is if there is just one ingredient on the list: “whole fruit”. So essentially, a product can be non-organic and not have any added sugar in it (e.g. non-organic milk), or a product can be organic and have added sugar (e.g. organic cookies). Hope that helps! I know it’s confusing so don’t hesitate to reach out if you have any other questions! What is the “best” sweetener to add to coffee or tea? I just can’t quite handle it black, but want to try and lessen the amount of sweetener I put in. What do you recommend? Hi Erin! If you need to add sweetness to your coffee or tea, just use regular sugar — either raw brown sugar, raw honey, or just organic granulated sugar are all great options. Try to stick to 1 tsp of sugar per cup (or less) if you can! Let me know if you have any other questions! Thank you for your help! We have been trying this organic blue agave. What are your thoughts on that? I know there is a lot of stuff out there on agave vs. honey. It’s hard to break it down and understand the right way. Hi Erib! Honestly between agave and honey — it just depends on which one you like better. Both are basically just added sugar – so both should be used sparingly. Hope that helps! I really needed this article! All of us at RKF medical made a pact to start eating healthier and for me that is tough, I’m a sugar addict! Thanks for the information! I have had gastric bypass, and must limit my sugar to 15 grams a day. But sometimes I just want something sweet. So I’m going to try making your Mini Apple pies with seiva then adding a thin sugar free (homemade) vanilla and cinnamon warm pudding. Do u know how I should figure out how much seiva to use instead of sugar. As I make mine with no recipe, the way my mom made it. Hi Penny! I think when you use Stevia for baking there are different amounts to use based on the amount of sugar you’re replacing. Here is a pretty good guide to what the sugar to Stevia ratios are when baking: http://healthyeating.sfgate.com/replace-stevia-sugar-baking-cakes-3385.html. Hope that helps! I followed on pintrest and can’t wait to see all of your different recipes! Thanks Mattison! Let me know how my recipes end up turning out for you! What a wonderful explanation, Anjali! Makes me feel less guilty about eating say plain strawberries for dessert instead of a snickers bar. Some people say to really watch your fruit intake because of sugar, but I just believe in moderation of everything..which includes fruit. Too much of anything is bad. But to not eat fruit because of sugar, just seems silly. Thanks for sharing. Enjoy your Saturday! No problem! And yes absolutely — you shouldn’t feel guilty about eating fresh fruit for dessert at all — that’s the perfect end to a meal! And fruits have a ton of other nutrients besides sugar (vs. a Snickers bar which doesn’t) – so there are other benefits to eating fruit which outweighs the slight downside from the natural sugar. I love these posts you are doing Anjali! They are so informative! Thanks! !